Liverpool captain Steven Gerrard admits its going to be a tough season without Luis Suarez. The Uruguayan striker left for Barcelona after the biting incident at the World Cup. Liverpool finished second last season behind Manchester City and Gerrard says Suarez is going to be missed. Luis Suarez has made a surprise visit to Melwood on transfer deadline day. The former Liverpool FC striker posed with his former team-mate Steven Gerrard, with both players holding a Barcelona shirt with the Suarez's name on the back. "He is back bearing gifts. Emotional saying goodbye to the main man this morning. "Best wishes to a phenomenal player." 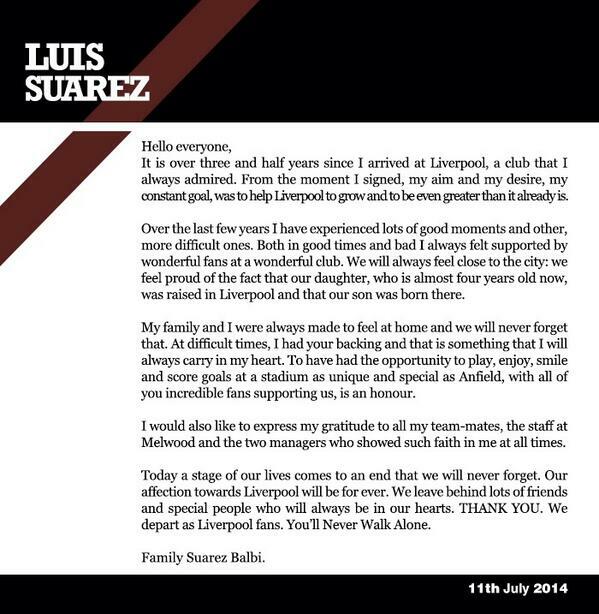 Luis Suarez has pledged that he will not bite again after finally being formally unveiled by new club Barcelona. The Uruguayan has been banned from football for four months after he bit Italian defender Giorgio Chiellini during the World Cup. "I say to all the fans: don't worry because I won't do that anymore," the Associated Press quoted the striker as saying. Asked whether he should have apologised earlier for the bit on Chiellini, he added: "I don't like having to go back. "That's something that happened and afterwards I was really depressed and didn't feel like doing anything. "But then I spoke to my psychologist and he said I had to face it and say sorry. "I did that and now I would rather focus on the present which is Barcelona." FIFA has re-iterated that Luis Suarez will not be allowed to train during his four-month ban for biting despite reports to the contrary. FIFA's disciplinary chief Claudio Sulser has said the Liverpool striker would be allowed to have a medical ahead of any transfer but the world governing body has stressed he cannot train with a team. A FIFA spokeswoman told Press Association Sport: "As said at various occasions he is not allowed to participate in any football activity during the ban period and as such is also not allowed to train with the team during the ban." Uruguay striker Suarez has appealed against the four-month ban imposed for biting Italy's Giorgio Chiellini. Liverpool remain in talks with Barcelona over the transfer of Suarez, and Sulser on Friday told a news conference that the player would be allowed to have a medical ahead of a transfer. Sulser said: "The player cannot have any activity related to football, but a medical examination for a transfer yes - the sanction is not linked to transfer rights." Italian player Giorgio Chiellini has tweeted Luis Suarez 'it's all forgotten' after the footballer made a grovelling public apology for biting him during their opposing team's World Cup game. 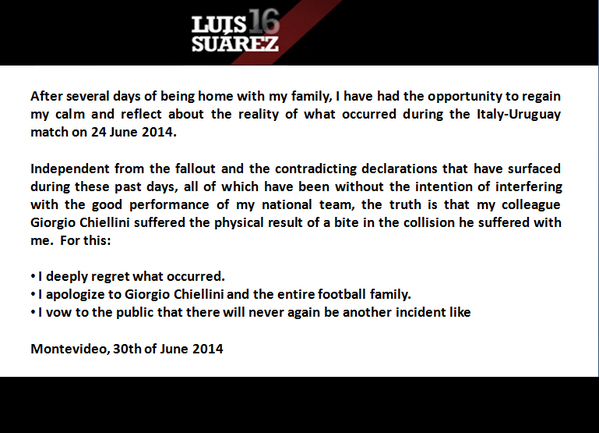 Suarez apologises to Chiellini and the "entire football family"
Luis Suarez has issued a statement on Twitter, apologising to Giorgio Chiellini and the "entire football family" for his bite on the Italy defender and promising "there will never again be another incident" like it. Sportswear giant adidas says its 'reviewing all marketing activity involving Luis Suarez'. The Liverpool striker has been banned from all football for four months after being found guilty of biting for the third time. Suarez's boot deal with adidas could be in jeopardy after the sportswear manufacturer announced on Thursday that it would consider its partnership with the 27-year-old, who has returned to Uruguay after his World Cup accreditation was withdrawn. His contract with 888poker was terminated on Friday. Diego Maradona has attacked Fifa's ban on Uruguay and Liverpool striker Luis Suarez as "criminal" and said world football's governing body might as well handcuff the striker and lock him up in Guantanamo prison. Maradona, who made to comments during his soccer commentary programme broadcast on Venezuela's Telesur and Argentine public television on Thursday night, asked: "Who did Suarez kill?" The Argentine footballing legend added: "This is football, this is contact. "They may as well handcuff him and bring him to Guantanamo directly. "If he made a mistake, fine, they should punish him, but they shouldn't exaggerate, they shouldn't be moralistic." 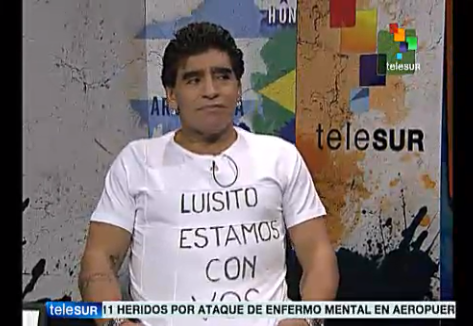 Maradona, who like Suarez rose to fame from a poor background, fervently defended Suarez throughout the programme and unveiled a T-shirt with the words "We're with you Luisito" scrawled on the front.